My dog says he's turning over the blog to his sister Faith today. Faith, have at it! Hi folks, I'm Faith. This is my first guest post on Puddy's blog. Today I felt compelled to write something personal so I hope you'll bear with me. I've been with my family since 2006. Three years ago on this very day I was lost, starving, cold, and scared. 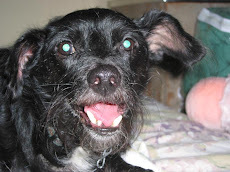 I was limping because I had been hit by a car and my teeth were in bad shape because I was so hungry that I was chewing on things that weren't edible (I was underweight and just a small, 75 pound little girl). I had just about given up hope that someone—anyone—would help me. That's when I saw her. A woman was getting into her car on a very industrial street. She was kneeling on the front seat, leaning into the back rearranging some bags and didn't see me on the other side of the road. MAC trucks were speeding by so fast it was all I could do to cross all four lanes to get to her in one piece. I had been through so much and I simply needed some help. Her car door was still open so I quickly snuck up and bolted inside. Safety at last! I was panting and pacing around in her compact car; so terribly relieved to be off the street. The woman stared at me in disbelief. I smiled. To make a long story short, the lady fixed me up, took me home, and made me part of her family. There are so many lost and scared animals out on the streets, fending for themselves, and I know I'm one of the lucky ones because I was saved (although she always tells me she's the lucky one). My only wish on my anniversary is that everyone who reads this does something to help an animal in need. Pick up a stray, feed a feral cat, take an injured wild animal to someone who can tend to his or her injuries. Make a difference, embrace compassion, and extend the circle of kindness to all animals, wild and domestic. Do something. Thanks for listening to my story. I hate to rush off, but my family has a special anniversary party planned for me. Gary, thanks for stopping by my blog. I'm glad you enjoyed Faith's story. We're so happy to have her in the family. She's a wonderful girl. Hope to see you around My Dog Says again sometime soon! This is such a beautiful and heart-warming story. Thank you so much for posting it Amber. So many strays out there who want to be saved, just like Faith. Give Titina kisses from all of us here at My Dog Says!